THE uppermost principle in streamer fishing is Be Aggressive. If low water nymphing is a game of subtlety and nuance streamer fish is ballsy, frenetic and all about taking chances. Pick a fly and fish it with confidence. Push those flies into and around cover, if you aren’t risking the fly your not in the game. Rip them back as fast as you can. Get that fly back into the water as fast as you can. The second principle might be Perseverance. Fishing streamers, big or little, isn’t an instant formula for success. Trophy trout, like anything else worthwhile in fly fishing and life, requires a good deal of sweat, some mental application and finally a slice of luck. Pay enough dues and you should score, but its up to the fishing gods how hard that process is going to be. The vagaries of fishing hold true everywhere, some days just are better than others, and all we mortals can do is try to lessen the odds. First off fish the water they give you, on the White it seems to be 8000 or better and rising is a good flow for what we are trying to achieve. We tend to prefer overcast days, but have popped some fish on bright days too and had some shockers on grey days. Generally gray and better yet rainy days seem to promote feeding activity, so too a rise in the generation flow. But that being said rainy days can bring good, sometimes spectacular fishing on lower flows and higher flows better fishing on bright days. The trick is committing to a lot of time streamer fishing and you will narrow the odds. So too will booking our streamer guides to ease your path. Pick your water to fish. Generally look to the ugliest, most boulder and tree strewn bank. These all seem to be the best cover for the better browns. They are often surprisingly shallow on the low light days. Generally the casts will be angled 30 to 45 degrees downhill (downstream) so the current will help speed up the fly’s dash away from the bank. Give it a rip, as hard and as fast as you can manage. Keep the rod tip low, even in the water, to minise slack and the rod tip pointed at the flyline. This is no place for gentle raised of the rod. 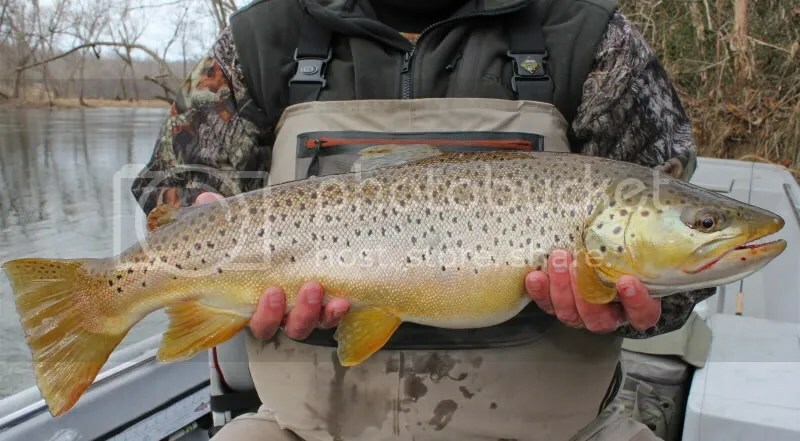 Think saltwater strip sets when you feel the hit, strip hard to drive the hook point home before you lift the rod, big browns have extremely bony mouths,. Sometime you will want to cast to the bank at 90 degrees to hit a particular spot, and it can work too, strip fast and erratic. A twist on the first presentation is to make a curve cast downstream so the first few strips of line pull the fly up parallel to the bank before it starts swinging out to the middle of the river. The trick is keeping those casts in the water and fishing hard.